Chocolate, lollies, cake, balloons, pass the parcel, loads of presents, friends and party hats and swirling twirling party skirts and singing: “Happy Birthday”! Our family has hit birthday season with a haze-filled thump. With our kids having birthdays 10 days apart and what with baking cakes for school, Scouts and not to mention having something with candles stuck on top to blow out at home, I usually get lost in a baking whirl and this recipe has saved my skin year after year.Becoming something of a birthday cake-making factory, I think I’ve even tripled or quadrupled this mixture in the past. You just throw all the ingredients in the mix master bowl and press the button. That’s it. The Ganache Icing is also deceptively simple and again, virtually instant and lusciously chocolicious!! 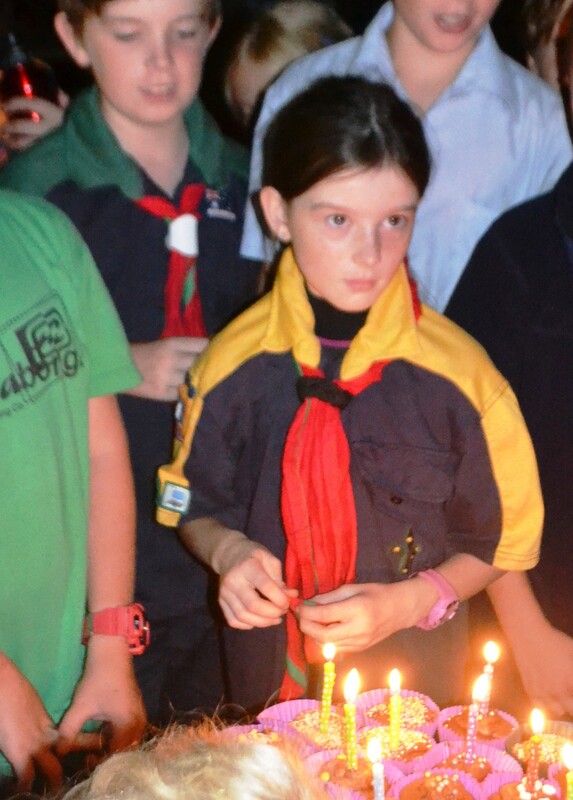 Happy Birthday Chocolate Cupcakes for Scouts. This recipe has been written in very easy to follow steps, bearing kids and inexperienced bakers in mind. So, you no longer have to resort to packet mixes and bought cakes. You, too, can bake from scratch, be a Masterchef and smile for the camera…I made it myself! That’s right. You can do it!! 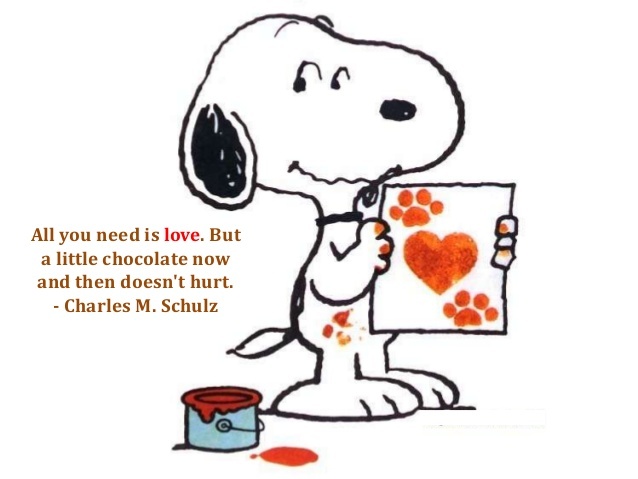 Who can argue with Snoopy? I’ve cooked with my kids all their lives. However, last year I decided it was time to ramp things up so they could cook a meal and become more independent. During this time, I realised that cooking teaches us so much more than simply producing a meal or a cake we can eat. It also teaches sequencing, time-management, multi-tasking, planning, health and nutrition as well as being environmentally-minded. It is also an ideal time to chat and bond with our kids, although things can get a bit fraught when creative minds don’t follow instructions and get ahead of the proceedings. However, at these times as you’re counting to ten doing your deep breathing exercises, it could be a timely reminder that life isn’t just about the destination. We also need to make the most of the journey and be a bit flexible…especially when it comes to adapting our adult ideas of cake perfection to the realities of living with kids. 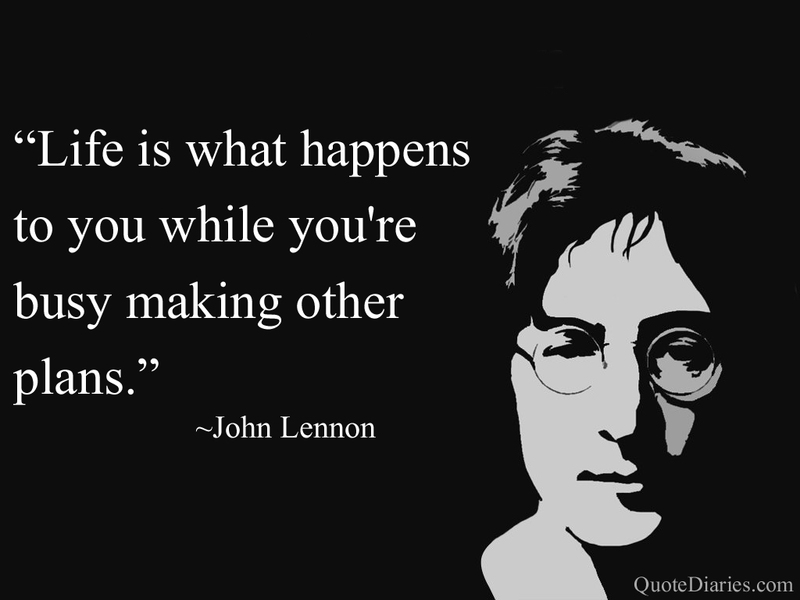 My Favourite John Lennon Quote: Quote Diaries. So without further sub-plots and asides, let the baking begin and don’t forget to lick but not double-dip the spoon! 1) Turn oven onto 180 degrees Celsius. 2) Line a 12 cup muffin or cupcake tin with patty papers. I usually give the tray a coat of pray oil beforehand for ease of cleaning afterwards. 3) Sift four and cocoa into a large mixing bowl. 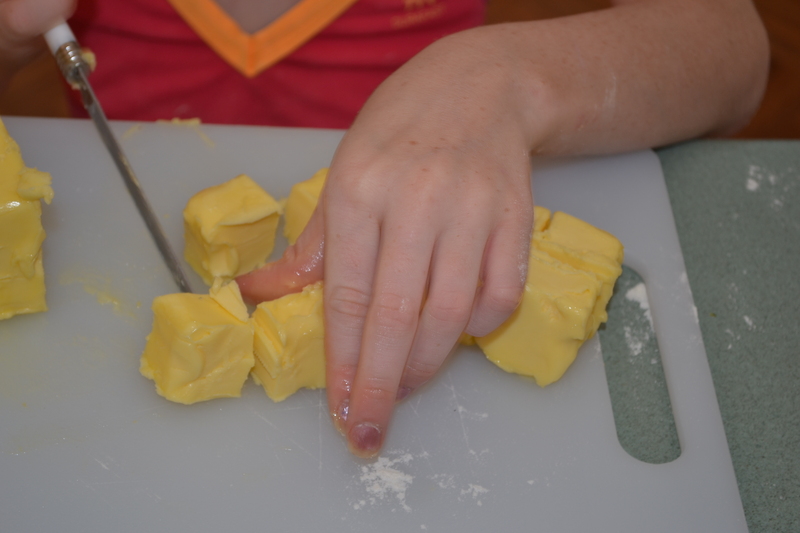 4) Add diced butter, vanilla essence, castor sugar, eggs and water. 5) Beat on low speed of an electric mixer master until the ingredients have combined. Then increase the speed to medium and beat for about 3 minutes or until the mixture is smooth and have gone lighter in colour. 6) Spoon a heaped dessertspoon of mix into each patty paper. 7) Bake for around 10-15 minutes or until a skewer comes out clean. 8) Stand for 5 minutes and then turn upside down on a wire rack to cool. 9)When the cake has cooled, ice with Chocolate Ganache. Fancy decorations like sprinkles, hundreds & thousands,stars etc optional. 1) Melt the chocolate in the microwave for about 1 minute. Remove. 4) Perhaps, I was just lazy but I simply dropped a teaspoon of Chocolate Ganache on top of each cupcake for a rich,decadent look. However, the kids couldn’t resist adding that splash of colour (and goodness knows how many artificial colours and flavours). Each to their own. Happy Baking & even Happier Birthdays! PS Just to prove that I’ve been making this cake for awhile, here’s this variation of a theme: Chocolate Hazelnut Indulgence Cake. It even has hazelnut praline. Yummy! This entry was posted in Australia, Baking, Kids learn to Cook, Parenting, Recipes, Uncategorized and tagged baking, birthday cake, chocolate, chocolate cake, chocolate cupcakes, chocolate ganache, cooking, cooking with kids, cupcakes, family, food, kids, kids' birthday parties, love, mom, motherhood, mum, Mummy, parenting, recipes, relationships on February 27, 2015 by Rowena. Grow Slow…Happy Birthday Miss 9! Last night, as I kissed our daughter goodnight, she said: “This is my last night of being eight.” She was overjoyed!! She’s one of the youngest in her year at school and it’s no secret she gets a bit cheesed off that it takes eternity for her birthday to come round each year. There’s only a couple of months and the frustrating tail-chasing game starts all over again. Like all kids, she wants to grow up too quick. Our “little Miss” is 9 going on about 15 especially when she struts around the house in her fancy silver high heels, which almost fit her now. It wasn’t that long ago that I’d bought them from the charity shop for dress ups!! That said, she is still a little girl and boys are still “yuck”…thank goodness!! I‘m not sure how long that’s going to last with her brother who turns 11 in less than a fortnight and heads off to High School next year. I have no illusions about what all of that means. However, I feel much better prepared for the teenage years than I was for early childhood. At least, I can remember what it was like to be a teenager and I’m sure it was only yesterday. Family Photo Back at Home 9 long years ago. As we celebrate another round of birthdays and I’m forced to think about the passage of time yet again, I am reminded of time’s cruel tricks. Since all other theories and explanations have failed, I’ve concluded there’s some kind of horrid, malevolent watch matcher lurking somewhere way up in the sky who keeps tinkering with the cogs and speeding things up. Don’t you agree? I mean…Surely time couldn’t move that fast unless it was taking performance enhancing drugs and even then we’re talking about lethally high doses. Someone or indeed, something, is doing an awful lot of tinkering with the gears up there. That’s the only way I can explain how time goes really fast when you want it to go slow and conversely barely seems to move at all, when you really want it to speed up like while you’re waiting in a supermarket queue and the person in front of you with enough food to feed an entire army can’t remember their pin and you’re running late and your child is standing on a street corner after dark in their ballet leotard and it’s cold and you don’t know what sort of creeps are hanging around. Time always goes agonisingly slow then!!! 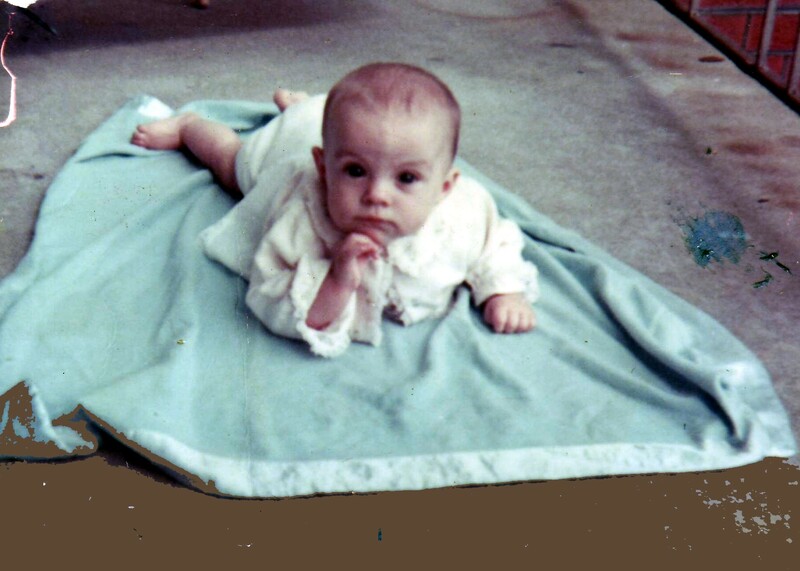 h Ever the philosopher, me at around 6 months. Once upon a birthday, my grandparents used to sing me “Happy Birthday” on the phone and my grandmother would tell me year after year, about when they “got the phone call” and my father told them they had a grand-daughter and they’d put her in a warmer. She always left out all the details such as how I was facing sunny side up and things had been touch and go. That THAT phone call wasn’t just about “it’s a girl”. It was a serious answer to prayer and their daughter and grand-daughter had made it through a rather perilous journey called birth. You forget that your baby is hopefully crying the first time you see them. There were no life or death dramas when our daughter was born, aside from when Big Brother, the inimitable “Little Man”, decided to climb up on the hospital bed to have a cuddle with Mum and activated the emergency switch. That immediately and brutally flung the head of the bed straight down and in the process, the drip stand fell down and bumped Miss on the head. 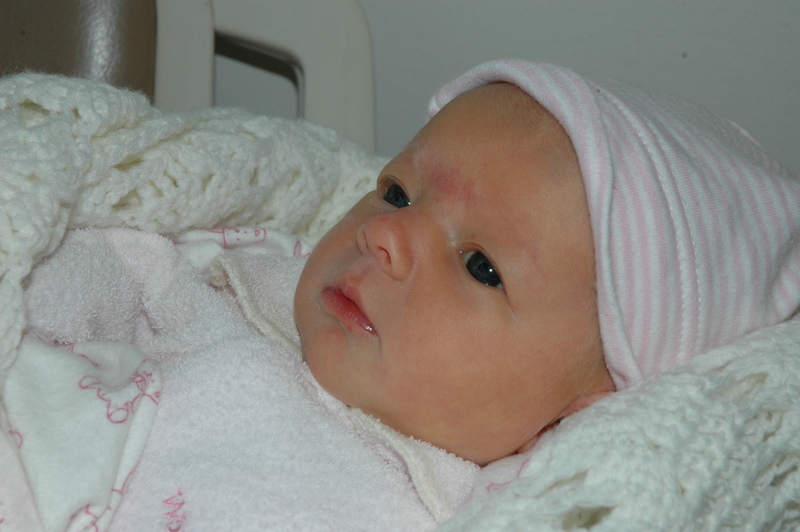 Miss ended up with a bruise on her forehead and was sent off to the Special Care Nursery for observation. A storm in a teacup but we still stir Mister about that. It’s not his only tale. The antics of “Little Man” are legendary but largely just involve a healthy curiosity combined with high speed. Little Miss a few days old. The other thing, I remember, of course, is the very first moment I saw her. 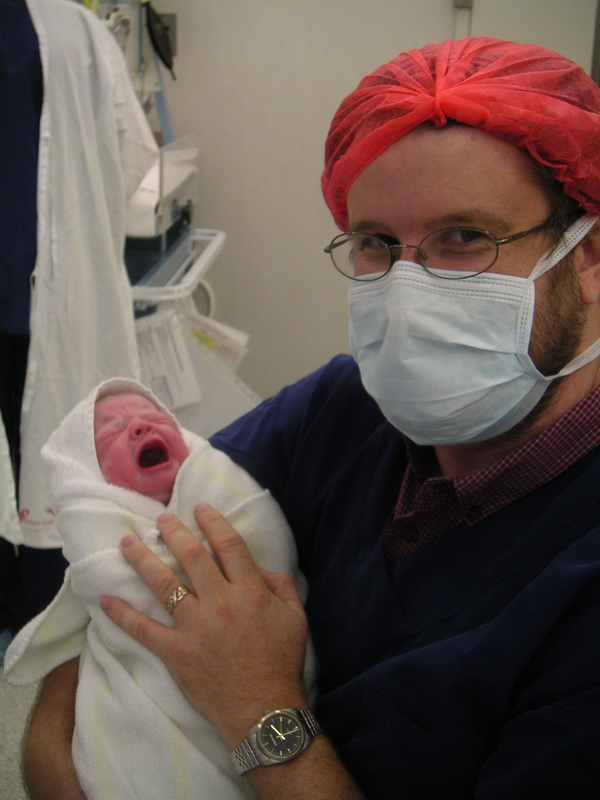 She was much smaller than I’d expected and only weighed 2.93 kg and was an average length of 49cm. She was exceptionally petite and I guess given that I’m quite tall myself (174cm or 5 ft 10″), I was a little surprised. She was so tiny that we needed to get her baby-pink, miniscule 0000 Bond Suits outfits from the Special Care Nursery where they were kept nice and warm for the premmie babies. My Mum was sent to buy some micro-clothes for when we went home. 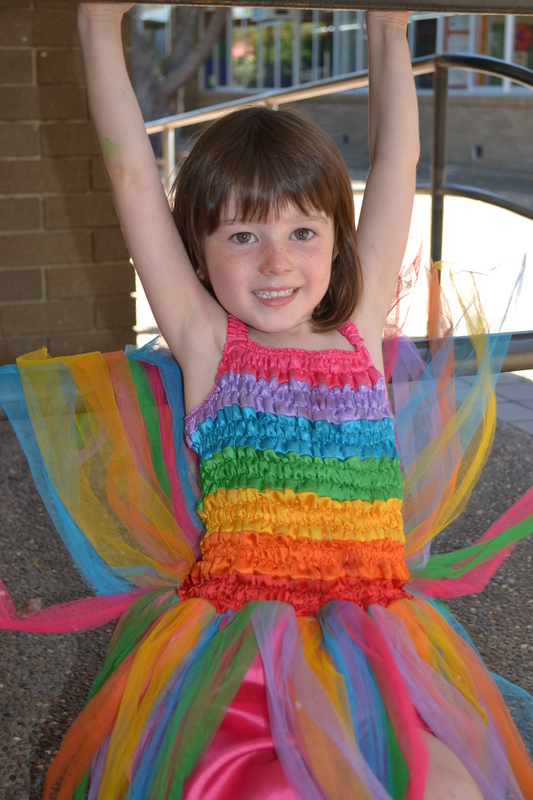 Our Gorgeous Little Rainbow Fairy Almost Aged 5 and About to Start School. I know I’ve mentioned time before but tell me, where does time go? I know lines like that are cliched and a road too well-traveled for a seasoned writer and yet, this great mystery still hasn’t been explained. Not all time travels at the same rate and where my daughter’s concerned, time has fast-forwarded faster than the speed of light!! Miss on her first day of school. 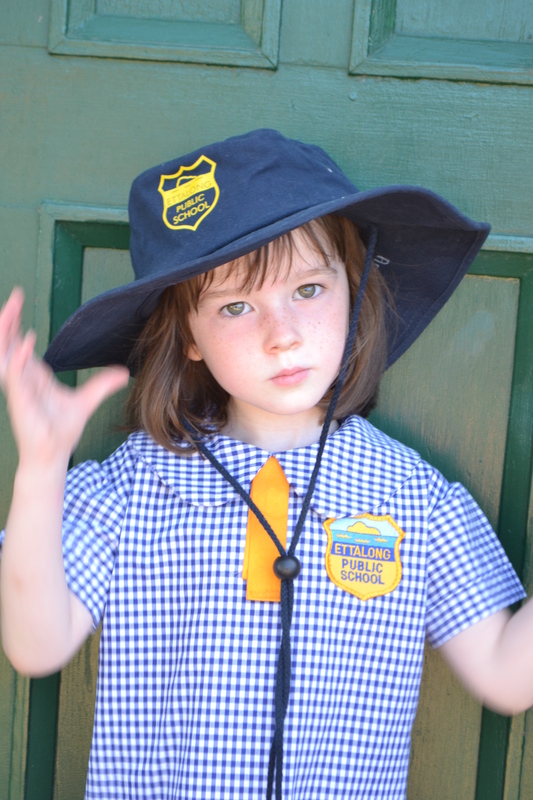 After all, I could have sworn she wasn’t born that long ago and she’s only just started school. Yet, somehow she’s migrated from infants into primary and is now well, perhaps not towering over all of the new kindergarten kids but has certainly moved on. I feel like I’ve been hit by a flying brick and I’m lost, almost in a trance or in a dream, while everything flies past me. I hope she’s had a Happy Birthday. 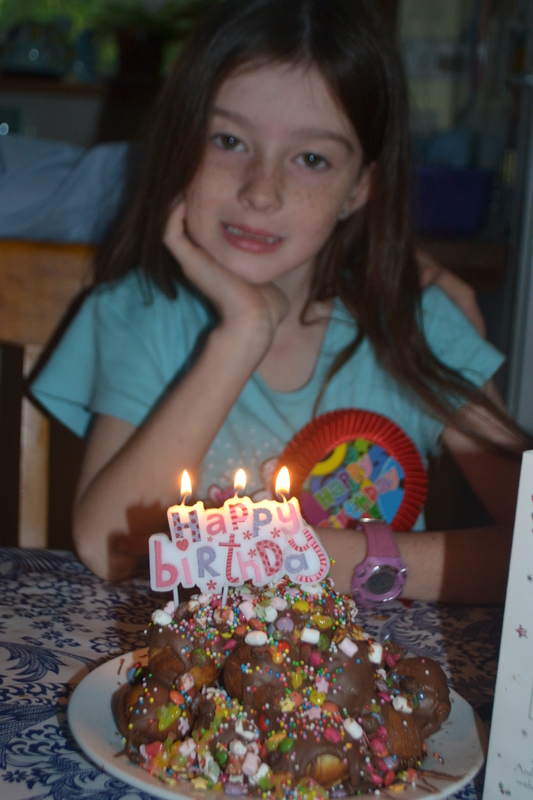 She opened her presents before school and as it turned out, the local radio station was at school this morning and they wished her Happy Birthday on air…much cooler than on Mummy’s blog!! 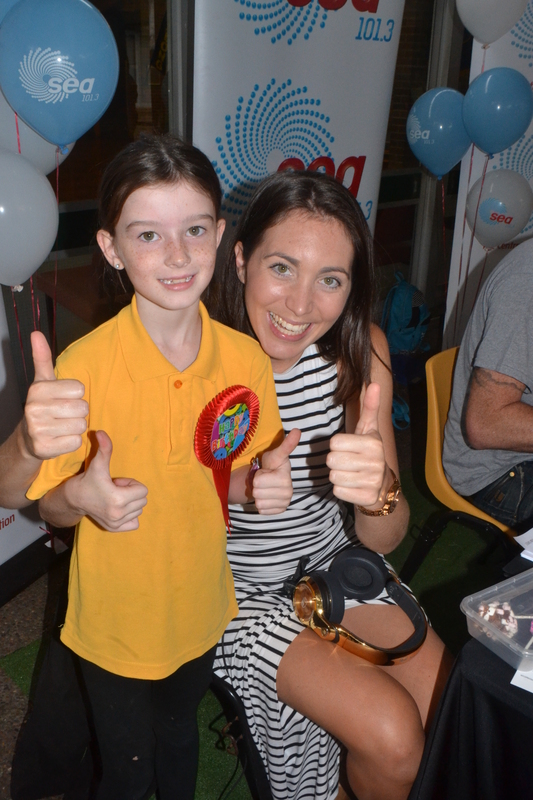 Miss celebrates her birthday with SeaFM Radio Host Kristi before school. She took the most amateur-looking Cake Pops to school for her class. I can’t believe I let her talk me into making those because, as my mother advised me, you never make something new for a special occasion and when I’ve broken that Golden Rule, I’ve regretted it. As we all know, regret with family birthday cakes is usually accompanied by nerve crushing angst, tears and if you’re really wound up…hurling the cake across the room. That is, if the dog hasn’t eaten the cake first. I have very bad memories of a food-thieving, greedy Old English Sheepdog called Rufus being caught in the act. That dog used to steal food and swallow it plastic bag and all. Eventually, we’d find the evidence deposited on the back lawn!! I don’t know how that dog survived for so long! 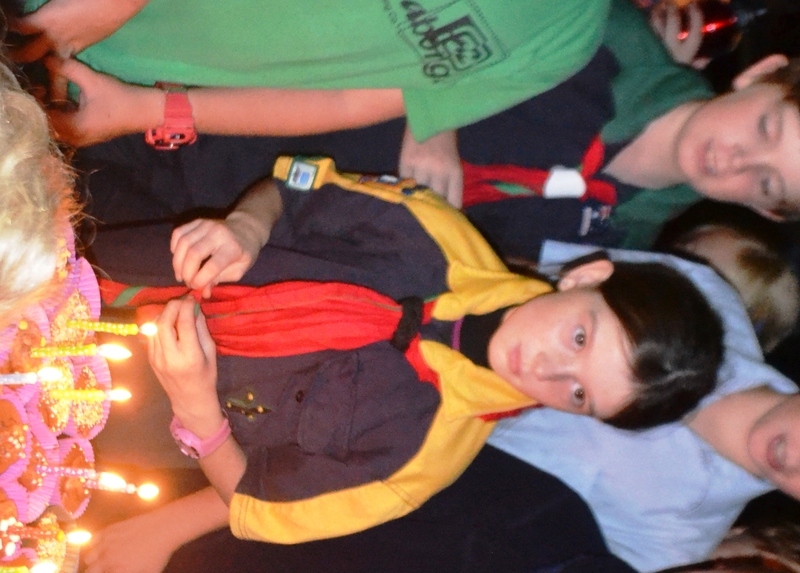 Instead of having a special birthday dinner tonight, the kids were off to Cubs and Scouts. As we still haven’t sorted out the details of either of the kids’ birthday parties yet, this was opportune as a few of their friends were there. That meant making a batch of chocolate cupcakes and huge boxes of chips for tonight’s celebration. Miss told the lady at the checkout that: “Scouts love junk food and we purchased supplies. What a great ambassador! There’s a world of quotes which I could pass onto my daughter but here are a couple from AA Milne’s: Winnie The Pooh. May all of your dreams come true..,in time. I’d like you to grow up before you open that dream fashion business in Paris. Climb some trees. Make clothes for your dolls and film them with your iPad. Ride your bike. Walk the dogs and wear your hair in plaits with rainbow nails and silver high heels, which are still too big and keep baking glittery cakes and drawing precious pictures just for fun. As much as you yearn to grow up, you can’t rewind time. It only speeds up. You might not appreciate it it now but there’s real beauty in growing slow. This entry was posted in Australia, Love, Parenting and tagged babies, baby, birth, birthday cake, birthdays, cake, Cake Pops, childhood, children, daughter, Feelin' Groovy, growing up, Happy Birthday, kids, love, mom, mum, parenting, Paul Simon, performance, philosophy, psychology, school, Sea FM, slow down, time, time flies on February 25, 2015 by Rowena. This entry was posted in Uncategorized on February 23, 2015 by Rowena. I had a sweet memory of my Paw Paw as I was chopping pecans for holiday treats. When I was a little girl we’d go pick pecans from the tree across the street from my grandparent’s home. While sitting in his lap, he’d take out his pocketknife and cut open the pecan—it was like he was peeling an apple—and let me eat the pecan meat. 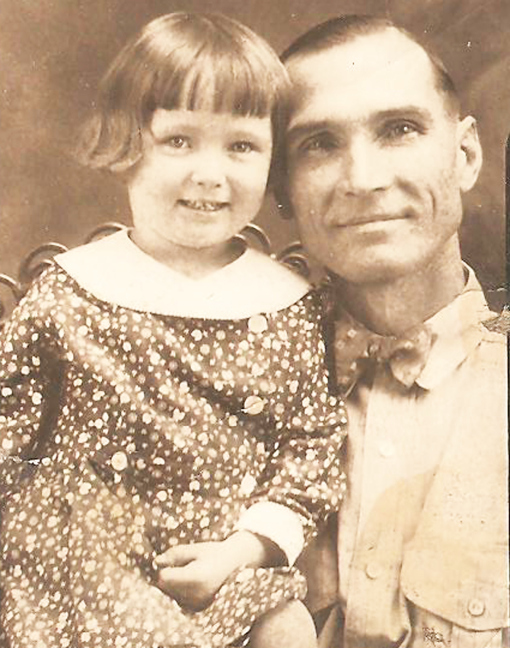 The picture is my Mom’s favorite of her and her Daddy. I’m sure he peeled pecans for her just like he did for me. 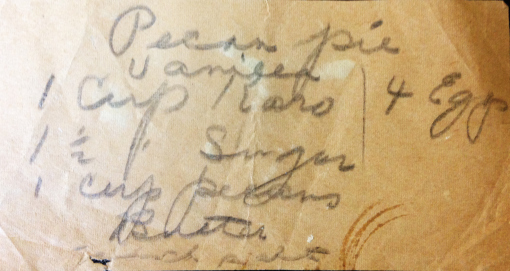 I imagine that my mom and her dad would eagerly await the delicious Karo Pecan Pie that my Maw Maw baked for her family. Compassion: Should you carry their load? If you have been following my blog over the last couple of days, you will know that I have been participating in a global blogging movement 1000 Voices Writing for Compassion and it went live on Friday for the United Nations Day of Social Justice. So, I have been spending what time I could over the weekend immersed in compassion, love but also a fair amount of cynicism and hurt..
That was a very insightful comment because there is that delicate balance between helping someone and dis-empowering them, which ultimately achieves what it describes. It takes away their independence leaving them unable to look after themselves, even when they might be quite able. Psychologically-speaking, this is known as “learned helplessness” but in everyday speak we call it: “use it or lose it”. Education: a form of compassion. Gee, I wonder why I’m going grey? After reading the many posts which were uploaded for 1000 Speak , I am rethinking how we help others and whether we should be providing long term, intensive assistance. Instead, shouldn’t we be educating and empowering people to find ways around obstacles through education, lateral problem-solving as well as finding ways to draw out and develop their strengths, instead of only seeing weakness and what they can’t do? This way, we can all extend, stretch and become ourselves in every conceivable way instead of being stunted like a bonsai. An oak is meant to be an oak stretching its branches right across the sky. It was never meant to be a table ornament!. Speaking as a person with a disability and when my auto immune disease flares up, I can become severely debilitated while my meds get increased to sky high levels. I sometimes get angry when I get stretched too far, especially as I have been doing this while parent two young, very active children . However, if I was never stretched, I wouldn’t grow and find out what I’m made of. In the last few years despite these health issues, I’ve learned the violin and now play in an ensemble and I have also learned to ski. While this seems like a miracle, it was actually the result of incremental small steps, perseverance and persistence. This seems to point to being stretched enough to challenge but not so far that we snap. Unfortunately, given the lack of support for people living with severe chronic illness or disability (by the way, anyone in the “severe” camp you could well have both) many are currently living in dire straights where even basic food and cleaning requirements are sadly lacking. When it comes to helping people with perceived weakness, we should never assume they can’t do something, although it might be considerate to politely ask if they need a hand. I’m forever leaving my walking stick behind and am very thankful when people chase me to give it back. I have tripped, injured myself and dropped handfuls of things and appreciated assistance and lauded the “Good Samaritan”. A friend of mine has given the kids lifts to and often from school and friends have also minded the kids when I’ve had medical appointments (I have lots of these). We appreciate meals from friends or Church particularly during rough patches but I am also training my kids to cook and I am adept at cutting corners as well as doing the gourmet thing. I just choose my moments. Meanwhile, I try to give back and I photograph events at the school and write press releases to help out where I can. After spending time with people with fairly significant physical disabilities, I have been quite surprised by what they can do both in terms of the everyday but also through incredible feats like climbing Mt Everest or completing the Kokoda Track. These achievements actually make me look twice at able bodied people wondering why so many are glued to the couch. Moreover, when we step in and carry someone else’s load, we not only stop them from growing and reaching their God-given potential but we also stop them from developing resilience. I’m surprised that more people haven’t heard about resilience because from where I sit, it’s that magic ingredient that allows empowers us to roll up our sleeves and get through adversity. However, encouraging and nurturing people to reach their potential doesn’t mean we should cut people who are struggling off without a safety net. Without the financial means to lead a dignified life, which for many people living with chronic illness or disability means a pension. We should never be left to fend for ourselves out on the street. Some of us can’t. We might be able to find ways around hurdles or pull off significant physical challenges for some one-off quest but that is different to what it takes to maintain a full-time job day in day out…especially while juggling medical appointments and procedures which I’ve heard so many describe as “a full-time job” in themselves. Perhaps, what I’m suggesting is that we offer a hand without taking over or accepting a gracious “no” if our assistance not required. We can also share our resources, I guess through the village which Lizzie Rogers wrote so eloquently about here: . We all have different strengths and weaknesses and by pooling our resources, we can all benefit: T.E.A.M: Together Everybody Achieves More. At this stage, this post is very much a work-in-progress and me thinking out loud in a bloggy kind of way and so I would really appreciate your ideas and feedback as these ideas are rather complex and probably something that requires more stewing but I wanted get it posted before 1000 Voices for Compassion finally clocks off in an hour’s time. After over-dosing on love and compassion over the last couple of weeks. Actually, I’ll rephrase that. you can’t overdose on love. Anyway, after all of this good stuff, I’m feeling 10ft tall…a tree which has outgrown so many, many expectations. Year after year, the cleansing rains fall and the rejuvenating sun shines through my leaves and warms my soul. My leaves change colour, fall and decay recharging the soil and feeding the worms working unseen. Children climb my twisted branches while their parents, grandparents, aunts and uncles shelter under the shade of my lush, green leaves. Families of birds nest in my leaves and sing each morning greeting the dawn. Possums swing from my branches at night and sleep in my hollows by day. Falling acorns spread my mysteries to foreign shores…or at least just further down the street. Sorry, there aren’t any koalas here. I am an oak tree, not a eucalyptus. Anyway, time waits for no one and it’s time to quickly upload this before the bell tolls. PS: This is a huge and very sensitive topic I’ve bitten off and really addressed on the run. Already, I am coming up with further points. For all of us, there is an issue of quality of life and finding ways of giving us meaning. So, if we can cut corners in some areas so we can have enough energy or finances to do what matters, that’s sensible. I know a very inspirational person living with a disability who uses a wheelchair, rides a bike and can walk somewhat. Using the chair extends what she can get done but she is still maintaining her fitness and mobility. I used to think you either used a wheelchair or you didn’t not that you could do this juggling act, which is yet another way of empowering the individual! I also wanted to mention finances for families living with chronic illness. I would estimate that many families with either a sick parent or child are in effect living on half an income. That one parent can’t work and might get some small amount from the government and then the illness chews up the other half of the income and then there’s what’s left and you’d better snaffle that up quick before the kids get hold of it!! This entry was posted in Compassion, Love, Parenting, Personal Development, Uncategorized and tagged #1000 Speak, charity, chronic illness, compassion, compassion fatigue, dependence, disability, education, equality, fish, fishing, growth, help, helping others, independence, learn to fish, love, personal development, philosophy, psychology, resilience, social justice, trees on February 22, 2015 by Rowena. Today, I am participating in an incredibly inspirational global blogging movement called 1000 Voice Speak for Compassion where a thousand bloggers are writing about compassion. I have spent the entire day reading through over 60 of these posts, which though a drop in to the proverbial ocean, I feel myself enriched, nurtured and like my heart and soul have richly fertilised through very intimate stories of hurt, pain trauma and loss. How someone’s kindness touched their hearts and brought a light through the incredible darkness. I have read very concise posts with some excellent tips on how to exercise more compassion in our lives because, as other bloggers pointed out, compassion is a verb. There have also been a lot of people looking around them and feeling a sense of despair as they observe and feel immersed in a culture that either doesn’t care, has compassion fatigue or is simple the “ME generation”. 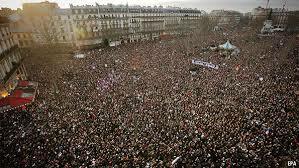 At the same time, these compassionate souls are determined to flow against this tide and be the difference. At the same time I have appreciated all that I have read and hopefully soaked it up like a sponge because as I said, I really felt touched, changed encouraged by what I read, I am also conscious that I haven’t even bitten off the tip of the iceberg. I want to read all 1000 posts even though this seems like such an impossibility. But you see, I don’t want to miss out. This project has brought bloggers together from right around the world and each of us has I’m sure tried to produce our very best and surely most inspirational work. This is the “if I could only write one post before I die, this is what I’d say” type of stuff…life-changing, unforgettable and something to cling onto like a limpet to a rock. If you haven’t tried getting a limpet off a rock at the beach, it’s pretty much impossible. They cling very, very tight!! 1) Thank you to those who use first names on their blog. So many bloggers don’t have first names or even no name at all. Here we are writing about the importance of compassion without getting personal. I almost always leave a comment on a blog because I want people to that someone has read their work and appreciated it. Comments make my day and being an advocate for the Golden Rule, I like to treat people the way I like to be treated. My name is Rowena although I also go by Roweeee and I like to start all my comments with a “Hi….” While just leaving names blank seems to be such a part of blogging etiquette, if you are reading this, I consider you more enlightened. We don’t need to be afraid of each other or ourselves and a first name isn’t going to announce your whereabouts. 2) While it’s all very well to write about compassion, we also need to read these posts ourselves…as many of the 1000 posts as we can. We will be so much better people for it. Moreover, what’s the point of spreading compassion out into the world if we don’t read and absorb our own medicine. The change starts with us. Writing really is in so many ways a monologue of talk and to be truly compassionate, we need to listen and in this context that means read! Read! Read! Yes, and respond writing comments and share and exchange perspectives and personal parts of ourselves. We need to be the change! It now seems like writing the post was the easy part! 3) I have noticed a mix of posts sharing positive experiences of people being compassionate to them through hard times and how the blogger was also there for someone. Came to their rescue. There have also been quite a few laments about a lack of compassion in our world and also the widespread prevalence of compassion fatigue both due to overexposure on TV or charitable fundraising efforts. Queenslanders played on during the flood clean-up. 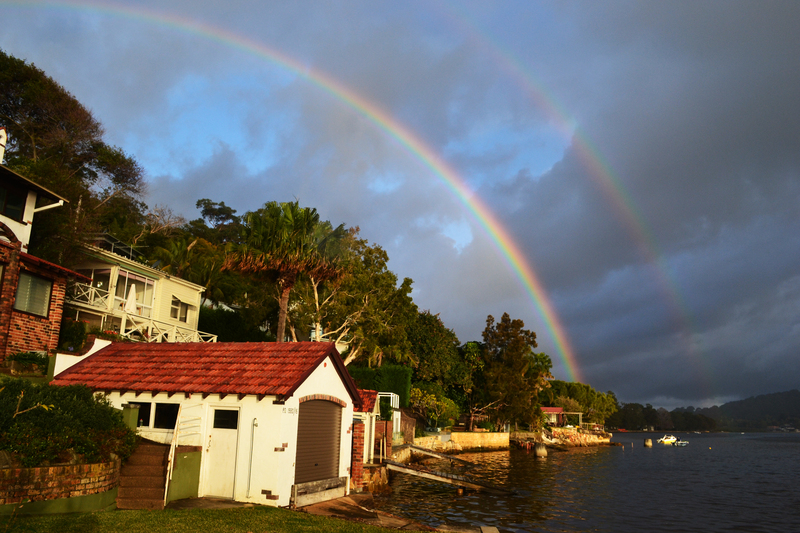 When severe flooding devastated Brisbane in January, 2011 more than 26,000 Brisbane homes were flooded: 11,900 completely submerged and another 14,700 were partially flooded. 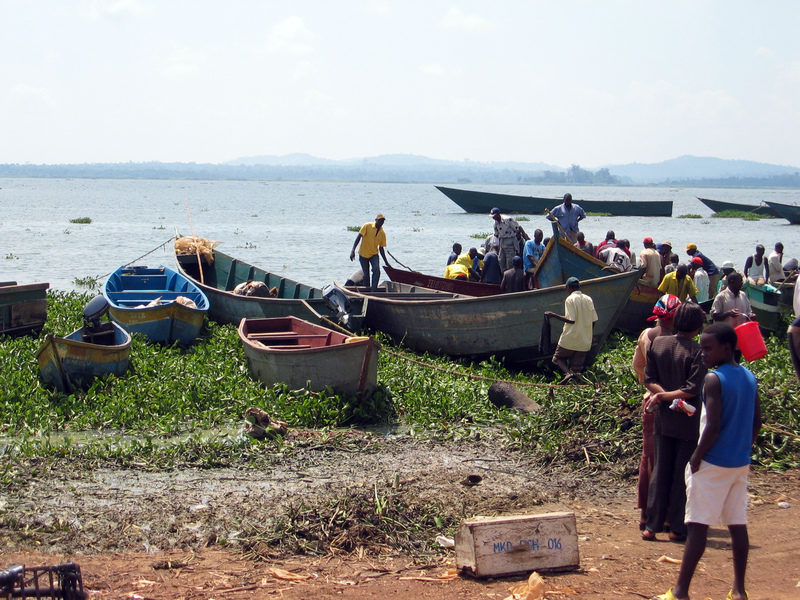 This crisis resulted in the creation of a volunteer army to help people clean the stinky river mud out of their home and clean the place up. The response was incredible with volunteers even coming from inter-state. More than 22,000 people registered with Volunteering Queensland to help. Talk about compassion in action!! 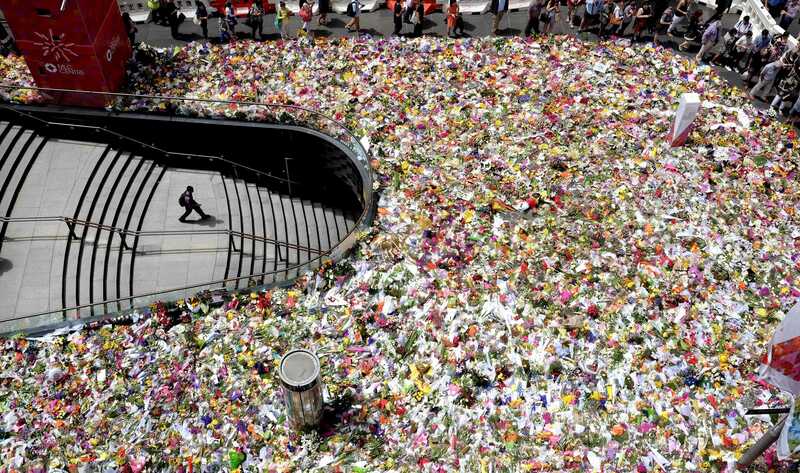 The huge floral tribute in Sydney’s Martin Place after the Sydney Siege in the Lindt Cafe in December, 2014. It is important that int those times of doubt that we remember these moments were love and compassion have triumphed over hate, violence, natural disasters and more. Through this celebration of compassion, we have sown the seeds of compassion on very fertile ground and we are now called on to nurture, water and feed those seeds to see them grow tall. This post is part of a blessed initiative 1000 Voices for Compassion conjured up by the wonderful Yvonne Spence and Lizzi Rogers at Considerings. Please visit their blogs and consider joining this huge campaign. We could all use more compassion. 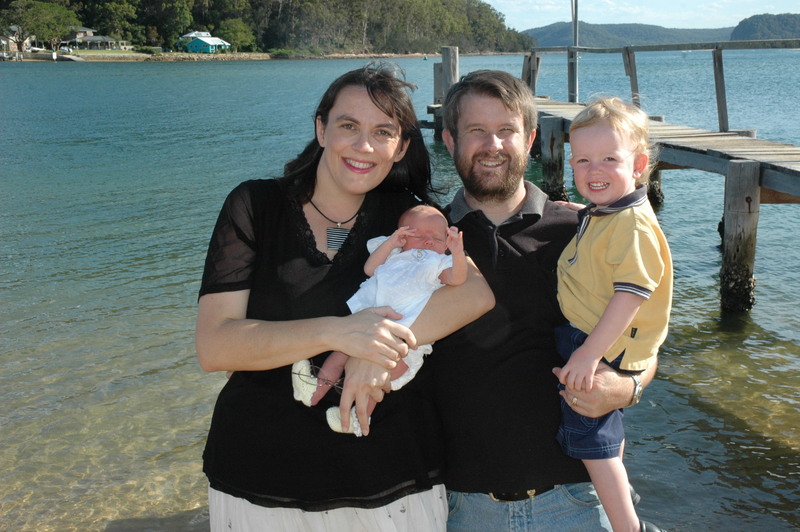 This entry was posted in Australia, Compassion, Love, Personal Development, Uncategorized, Writing and tagged 1000 Voices for Compassion, compassion, compassion fatigue on February 21, 2015 by Rowena. Since getting involved in an exciting global blogging movement called 1000 Voices Speak for Compassion, I have been thinking about what makes a great act of compassion. What is perhaps even the ultimate act of compassion? However, I’ve concluded that you can’t really apply a measurement scale to compassionate deeds. After all, even a small deed can be a life-changer and a huge effort might ultimately make no difference at all. Besides, if we are being compassionate, we’re not about assessing and measuring good deeds and certainly not running around showing off about our own great deeds doing the whole “look at me! Look at me! routine perfected by Australia’s much loved drama Queens: Kath & Kim. On the other hand, since we are writing about compassion, I thought our blood donors deserved an extra special mention. 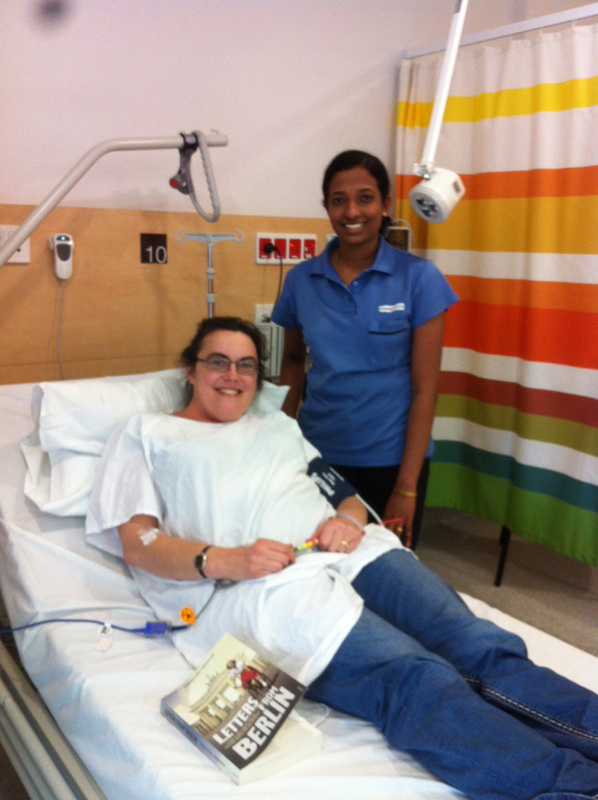 A blood donor and nurse. 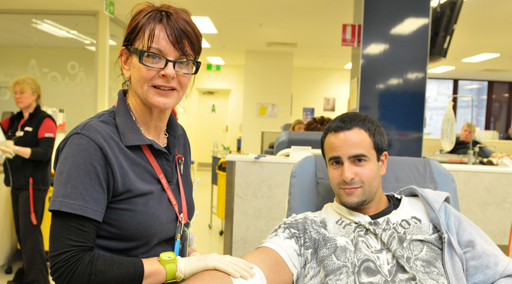 In 2013 the Australian Blood Service collected 1.32 million lifesaving blood donations. Every week Australia needs over 27,000 blood donations and there are just under 504,000 voluntary unpaid donors. Many of these donors donate like clockwork and it’s part of their routine. Unsung lifesaving heroes, there are no screams when they see the needle or fainting at the sight of blood or wailing that they’re going to die, they simply roll up their sleeve and get on with the job. Australian blood donors are unpaid and the only thanks they get is a smile, a cup of tea and a biscuit.As I said, they are unsung heroes and I thank them from the bottom of my heart. That’s because they have saved my life. Happy Me! Getting my infusion in the brand new hospital and reading a great book! I have a rampant, systemic auto-immune disease called dermatomyositis which affects my muscles, skin, digestive tract and lungs. After conventional treatments didn’t really work, I received life saving infusions of Intravenous Immunoglobulin (IVIG) I received those infusions every three weeks for 5 years and they saved my life by somehow tricking or replacing my faulty immune cells with those of healthy blood donors. While we’re talking about blood donors, there another very special kind of donor I’d like to mention. These are the family and friends of organ donors who make what can be a very difficult decision when they are going through extremely intense grief and anguish themselves as they lose the person they love, often through an unexpected, tragic accident where they’ve had no warning. While suffering their own anguished grief, have had the compassion to stop another family from walking in their lead shoes. Organ donation is also something I have addressed personally. This very same auto-immune disease has also brought the whole issue of organ donation very close to home. as it’s attacking my lungs, causing fibrosis or scaring. The nature of this disease means that I am probably not a good candidate for an organ transplant and for me this means focusing on saving the lungs I’ve got. So far, so good…I am back in remission. However, there are so many people on waiting lists where an organ donation means the difference between life and death. That a child still has their mum or dad or that those parents of a very, very sick and dying child, don’t have to say goodbye. I understand that when you have lost someone close to you, particularly when they are young, that there isn’t anything worse. Words just can not describe that depth of grief or loss. I’ve had a glimpse into that pain and it is anguish. Whenever I’ve been faced with losing my own life and leaving my kids behind, the anguish has been utterly unbearable and I can feel my heart being ripped out of my chest without any form of anaesthetic whatsoever and my soul is screaming, howling completely and utterly inconsolable. While the family’s who have lost someone are going through that grief, they can potentially spare another family that anguish and make an incredible difference to so many, many people. Kerry, another blogger who is also taking part in 1000 Voices Speak for Compassion, and her family were spared this anguish when her brother received a donor kidney last year. Both Kerry and her brother live with a rare kidney disease and had received a donor kidney from each of their parents. While Kerry’s kidney from her Dad is still working 18 years later, her brother’s kidney from their mother failed, which meant they were reliant upon a donation from a stranger. Initially, he went back on dialysis until he received a donor kidney from someone who had tragically died in an accident. Some people cross that bridge and have the courage and compassion to make that choice but most do not and the rate of organ donation remains crushingly low and people die unnecessary deaths. 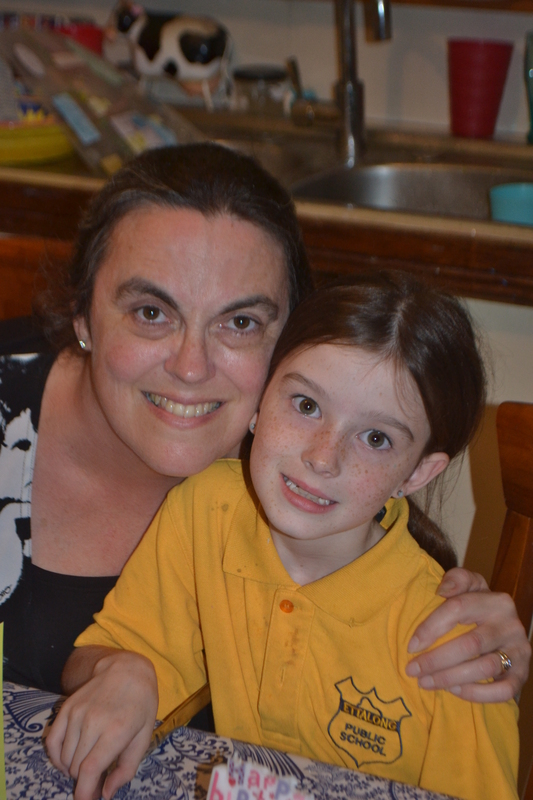 Around 1,500 people are on Australian organ transplant waiting lists at any time. 1) Become a blood donor. 2) Speak to your loved ones about becoming an organ donor and also discuss their wishes so they when the time comes and there are any bits and pieces which aren’t totally fried and pickled, the decision has already been made. These are two ways where 1000 bloggers could really make a permanent and transformation to our world. I can’t wait to see where 1000 Voices Speak for Compassion takes us. I know it has certainly changed me!! Love & best wishes to you all!! This entry was posted in Australia, Chemotherapy, Compassion, Health, Love, Uncategorized and tagged #1000Speak, 1000 Voices Speak for Compassion, blood donation, chonric illness, compassion, cystic fibrosis, dying, giving, grief, love, organ donation, organ transplant, parenting, Red Cross, social justice, survivor, transplant, World Day of Social JUstice on February 21, 2015 by Rowena.